Home » Earth SOS » Natural Gas Extraction: Is It Really a Clean Alternative? The process of Hydraulic Fracturing, more commonly known in the media, as fracking is the process by which oil and gas companies extract natural gas from reserves deep in the ground. The fracking process was invented by American oil and gas company Halliburton in the 1940s, and has increased dramatically in recent years. In regards to the US, “Domestic oil and natural gas production has increased every year President Obama has been in office.” After the Deep Water Horizon oil spill, and the Iraq War domesticating a ‘clean’ energy source would seem like the right move for the Obama Administration to make. However, the effects of fracking on environmental and human health are less obvious, but no less profound. The Obama Administration has “cut net oil imports by 1 million barrels per day.” In 2011, the US was the number one producer of natural gas globally, producing 2.97 trillion ft3 on public lands. Natural gas is seen as a ‘clean’ energy alternative to coal burning and ‘safe’ alternative to nuclear power. For these reasons natural gas extraction continues to grow in North America and Europe. Despite the ‘clean’ appearance of natural gas the realities are quite different. The fracking process occurs 8000 ft below the earth’s surface allowing chemicals used in the fracturing process to contaminate ground water and Treatable Ground water aquifers, private wells and municipal water sources. An Increasing number of natural gas reserves have been found all over North America. The oppositional firestorm aimed at the oil and gas companies currently ‘fracking’ in the US has been centered on the ‘fracking’ occurring on the Machellus Shale gas reserve. This watershed contamination could eventually cause the pollution of New York City’s main water source. The Marcellus shale gas reserve is perfect location for natural gas extraction, there is both large supply and near to a profitable market. Dimlock, Pennsylvania is perhaps the hardest hit by the dangerous chemicals seeping into residential water supplies. 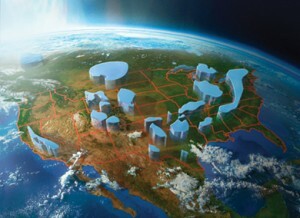 However there are at least 22 shale basins located onshore in more than 20 states in the U.S. including Alaska, Louisiana, New Mexico, Oklahoma, Virginia, Wyoming, Arkansas, Colorado, and ‘other states’ including West Virginia, Pennsylvania, New York and Michigan. Canadian natural gas production is mainly centered in Alberta, Saskatchewan, and Manitoba. However it is also occurring in British Columbia, Ontario and in the offshore field off the coast of Newfoundland and Labordor. According to, “a 2010 congressional investigation revealed that Halliburton and other fracking companies had used 32 million gallons of diesel products” [in their extraction process], including the above-mentioned toxic chemicals. The in-depth investigation in 2010, lead to the eventual close of the ‘Halliburton Loophole’ in 2011 which forced the oil and gas companies involved with fracking to disclose chemicals used in their process. Online news source, The Atlantic also indicates that, this new law will allow doctors in Pennsylvania to access information about chemicals used in natural gas extraction, but won’t be able to share it with their patients. The lobbying power that oil and gas companies have in the US government makes government imposed transparency of these industries increasingly difficult. And further highlights how difficult it is for the citizen’s effect by fracking to receive compensation from these companies. Just because the oil and gas industry has to disclose the chemicals used in their extraction does not mean that the industry’s production will slow. The national and state governments are encouraging natural gas production to better the US economy. The oil and gas industry is consistently criticized by environmental organizations for their apathy and blatant disregard for the ecosystems where they operate. The relatively new boom in natural gas extraction technique, fracking has received the attention of many U.S. and Canadian citizens. Fracking was featured in the 2010 Sundance Documentary, Gasland receiving international recognition and praise. This film further emphasized the relationship industry has with the environment, the scary realization that industry in some instances can win out over human health. Josh Fox, director of Gasland uses the hydraulic fracturing process to illustrate the power the oil and gas industry have over the public health and essentially have more power than the government who were set out to regulate them. Profits made by companies like Halliburton, Cabot and ExxonMobil through fracking are put above the environmental and human health concerns. So… Is natural gas really a ‘clean’ energy alternative? Resoundingly, in the literature and citizen blogs, the answer is no. Unfortunately our overwhelming energy demands requires us to look for alternatives. Natural gas may be cleaner than crude oil, but its quite chemical contaminants make is nonetheless dangerous and harmful to the environment and human health. Natural gas is seen as a ‘clean’ energy alternative to coal burning and ‘safe’ alternative to nuclear power. For these reasons natural gas extraction continues to grow in North America and Europe. 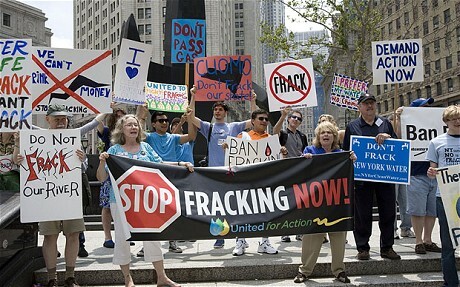 The word is spreading about the dangers of fracking and its potential to harm large-scale aquifers, and watersheds. Obama’s administration groups wind, solar and natural gas as clean energy sources. This is skewing the realities of natural gas extraction far-reaching environmental impacts. The contamination of public water sources by oil and gas companies can be considered domestic terrorism. Methane and ethanol are the major chemicals concerning residents, however the slue of other chemicals involved in the fracking process are also being researched further for their environmental and public health effects mentioned earlier. A less obvious environmental danger of the fracking process is air pollution. Diesel exhaust produced by trucks transporting the 1-8 million gallons of water used to frack a well contributes to carbon emissions. In addition to this, diesel exhaust combined with, “VOCs create ground level ozone. Ground-level can contribute to severe respiratory and immune system problems.” According to Josh Fox’s research these ozone layers can extend 250 ft. The contamination of the foodshed demonstrates the interconnected nature of ecosystems and contaminates entering them. Water pollution in the home can be remedied through the purchase of bottled water (precipitating another harmful environmental trend). The contamination of livestock, wildlife and agricultural products in areas effect by fracking are increasingly prevalent. The toxins consumed by livestock through water and grass consumption contaminate the food chain. The toxins are absorbed into the cattle’s (or other livestock’s) muscle tissue are then transferred into humans. A Cornell University study found that in Garfield County, Colorado, “A bull went sterile, and a herd of beef cows stopped going into heat, as did pigs. In the most striking case, sheep bred on an organic dairy farm had a rash of inexplicable stillbirths — all in close proximity to drilling waste pits, where wastewater that includes fracturing fluids is misted into the air for evaporation.” A yearlong study by Cornell released in 2012 concluded that what was happening in Garfield county was not an anomaly and was happening in 5 separate states. Colorado alone has over 3,200,00 acres of irrigated cropland that is now in danger. This is not an isolated trend; it is tied to fracking chemicals. 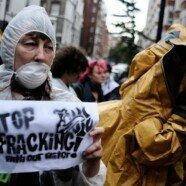 Where ever fracking occurs food shed contamination is sure to follow. Oil and gas companies need to be held accountable. Now that the Halliburton Loophole is beginning to close, transparency on the rise and citizen involvement increasing more studies are surfacing abut fracking dangers. This is a multi-faceted environmental issue and urgent action is needed. Water is essential to human, animal and plant life. Citizens’ protests and action are being rewarded in Germany as German, “Environment Minister Norbert Röttgen and Economy Minister Philipp Rösler have agreed to oppose the controversial [fracking] process for the time being.” Obama has also made proposed legislation earlier in May to increase transparency of the oil and gas companies. However, with an election looming in the US it will be interesting to see how far his commitment will go. For Americans the economy is the most sensitive issue in the upcoming election. Speak out, and legislative results are possible. If the demand for natural gas reduces and demand for truly green energy sources increases innovative technology will have the competitive edge over the traditional ‘dirty’ energy sources. More investment, education and awareness is needed in both the solar and wind sectors to reduces our demand on energy sources such as natural gas. Change is possible, but the economic incentive and environmental consciousness, and citizen involvement is needed to change the system which is inherently self-serving. A paradigm shift from the current unsustainable energy extraction to sustainable energy production is drastically needed. We all have a part to play. Brown, V. J. (2007). Industry Issues: Putting the Heat on Gas. Environmental Health Perspectives , 115 (2), A76.